Hi Steemit, today I want to talk to you about how we can determine the chemical composition of an unknown plastic. How we know, most of the plastics that are made today are derived from petroleum, particularly the gas that is generated in oil wells. This natural gas is chemically transformed into petrochemical complexes generating derivatives with higher added value, such as ethylene, vinyl monochloride, propylene, all of them raw materials for the synthesis of polyethylene (PE), polystyrene (PS) and polypropylene (PP) ), with which you can make various everyday products, such as packaging, bottles, glasses, plates, cutlery, among others. 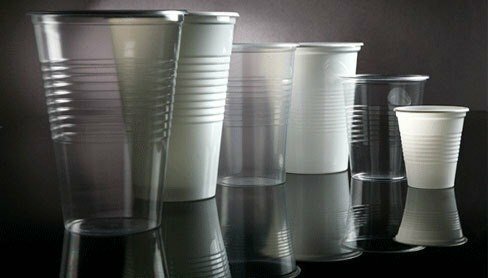 In this post I will show you how, step by step, the composition of plastic materials can be determined, using the infrared Fourier transform spectroscopy technique, using as an example a plastic cup (Figure 2). It should be noted that the way in which this practice is formulated, as well as the results and analyzes are part of the induction courses that I have given to students at the research institute where I work. The Fourier transform infrared spectroscopy technique (Figure 3) is very useful for the identification of chemical compounds since it is based on the principles of molecular spectroscopy. 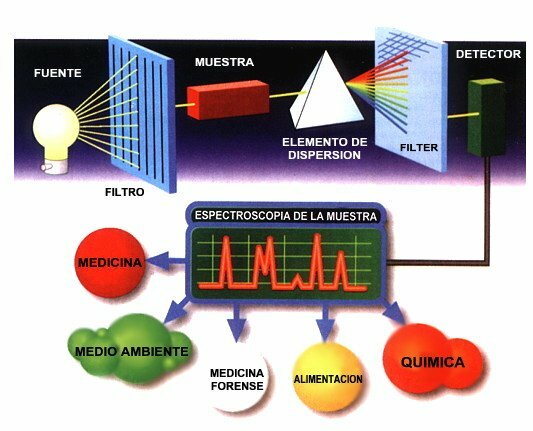 The basic principle behind molecular spectrometry is that molecules absorb energy from light at specific wavelengths, known as their resonance frequencies (vibration) (Silverstein et al., 2005). The analysis in an infrared spectrometer is carried out by placing the sample in a cell, where it is subjected to a source of infrared light, which performs a sweep from the wavelengths of 4000 cm-1 to 600 cm-1. The intensity of the light transmitted through the sample is measured in each wave number. This makes it possible for the amount of light absorbed by the sample to be calculated by a differential between the intensity of the light before and after passing through the cell, thus obtaining the infrared spectrum. Finally, the infrared spectrum of the sample will allow to identify the functional groups present in it (Silverstein et al., 2005). From a plastic cup, a thin film was cut. The film was placed in a sample holder and then placed in a Fourier transform infrared spectrophotometer, Perkin-Elmer model Frontier model (figure 4), previously calibrated with polystyrene (standard standard suggested by the manufacturer). The infrared spectrum of the test sample was obtained after accumulating 24 scans with a resolution of 2 cm -1 in a range of 450 to 4500 cm -1. 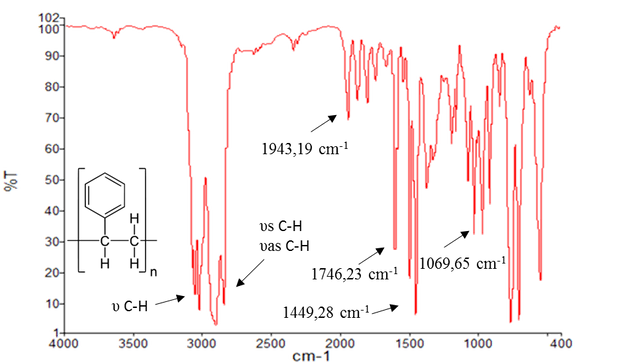 In figure 5 the infrared spectrum of the test sample is observed, in which the absorption bands characteristic of an aromatic tension C-H 3081 cm-1 - 3027 cm-1 are observed; 3004 cm-1. A band between 2921 and 2851 cm-1 is shown, related to the symmetric (υs) and asymmetric tension vibrations (υas) of all the C-H bonds. 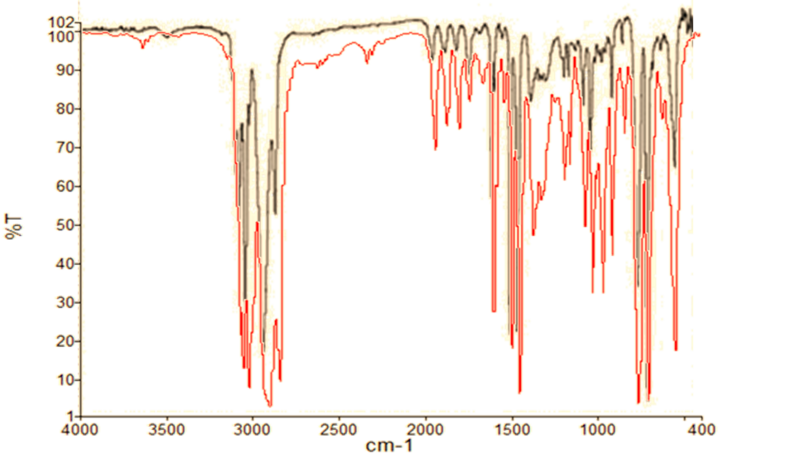 An absorption band of the monosubstituted aromatic ring at 1943 and 1746 cm-1; to 1449 cm-1 the deformation CH2 + C = C of the aromatic ring and to 1069 and 780 cm-1 the flexion C-H in the plane is observed. These absorption bands allow us to identify the compound since when comparing the results obtained with the main theoretical infrared spectra of the polymers used for this type of products (Polyethylene, Polystyrene, Polypropylene, among others), it is confirmed that the vessel material is made of Polystyrene (Figure 6) (León and Salazar, 2008), a thermoplastic with many desirable properties, used in the production of disposable cups. This polymer is transparent, easily colorable and easy to produce. Using the infrared spectroscopy technique we can determine the main functional groups of a plastic material, being able to identify what compound is made of. What is a very useful tool for the identification of unknown materials.